If for your special occasion or themed event, style means wearing an artisan-made mask from Venice then this stunning mask is for you. 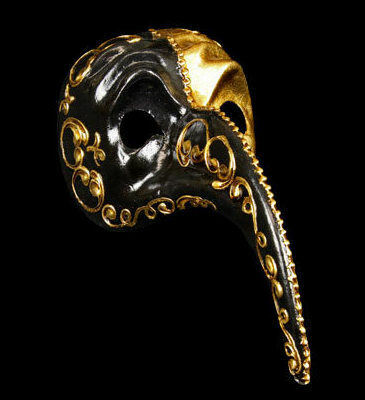 The Naso Turco like all the Simply Masquerade full face Venetian masks is 100% original & handmade in Venice in the time honoured tradition by today’s craftsmen. Beautifully painted in colours of antiqued gold leaf and black, segmented & bordered by aged gold - look closely to see the brush strokes and paper layers which give away the fact that your mask is not machine made or mass produced. With the full face design you don't need to sacrifice comfort because the Naso Turco is easy to wear & ties easily with satin ribbons, staying in place all through your party. Simply Masquerade is your first choice for your masked ball or special event when only authentic Venetian luxury will do.